Keep yourself covered in the Socksmith Solid Over-the-Knee socks! Sold as a one-pair pack. Over-the-knee high length offers extended coverage. Self-adjusting welt cuff. Deep heel pocket. Y-stitch heel. 55 percent cotton, 43 percent nylon, 2 percent spandex Machine wash cold, dry flat. Imported. Give your casual look some edge with the eye-popping Big Muertos Skull socks by Socksmith. Sold as a one-pair pack. Crew-cut style sits at the calf. Self-adjusting welt cuff. Ribbed cuff. Elastic arch support. Deep heel pocket. Y-stitch heel. 63 percent cotton, 34 percent nylon, 3 percent lycra. Machine wash cold, tumble dry low. Imported. Tell your boring socks to mooooove over for the Socksmith Cow Spots Knee High. Sold as a one-pair pack. Knee-high style offers extended coverage. Cow spot print throughout. Self-adjusting welt cuff. Deep heel pocket. Y-stitch heel. Low-profile toe stitching for great in-shoe feel. 63 percent cotton, 34 percent nylon, 3 percent spandex. Machine wash cold, tumble dry low. Imported. Pass the doobie to the left-hand side while you are in the Pot Leaves Knee High Socks! Sold as a one-pair pack. Knee-high length offers extended coverage. Jacquard woven marijuana leaf print. Self-adjusting welt cuff. Ribbed cuff. Deep heel pocket. Y-stitch heel. Low-profile toe stitching for great in-shoe feel. 63 percent cotton, 34 percent nylon, 3 percent spandex. Machine wash cold, tumble dry low. Imported. 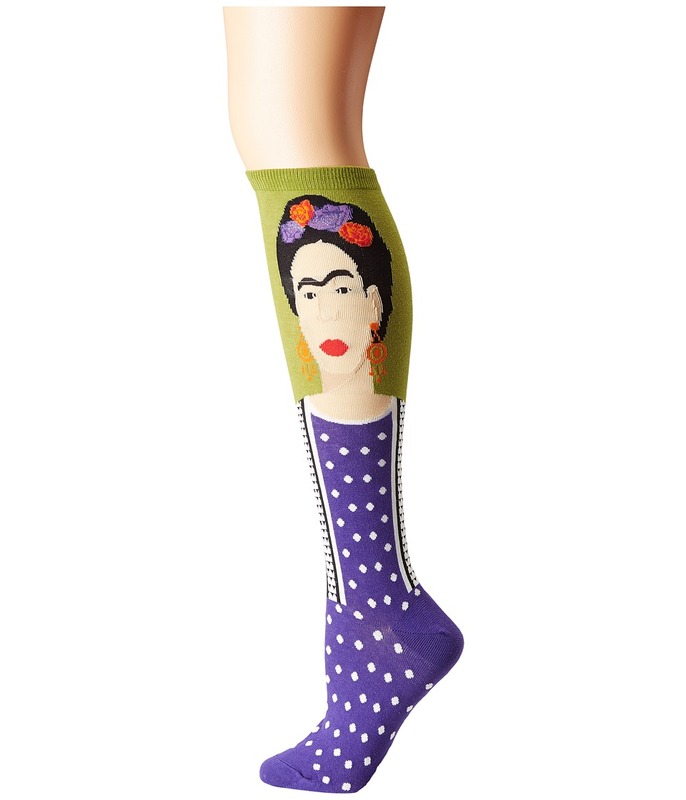 Unleash your creativity while you are in the Frida Knee High Socks! Sold as a one-pair pack. Knee-high length offers extended coverage. Woven Frida and polka-dot design. Self-adjusting welt cuff. Deep heel pocket. Y-stitch heel. Low-profile toe stitching for great in-shoe feel. 63 percent cotton, 34 percent nylon, 3 percent spandex. Machine wash cold, tumble dry low. Imported. From the Bay to LA, we can all agree these Socksmith pair well with a beer and burrito. Sold as a one-pair pack. Knee high length offers extended coverage. Self-adjusting welt cuff. Deep heel pocket. Y-stitch heel. 63 percent cotton, 34 percent nylon, 3 percent lycra spandex. Machine wash cold, tumble dry low. Imported. 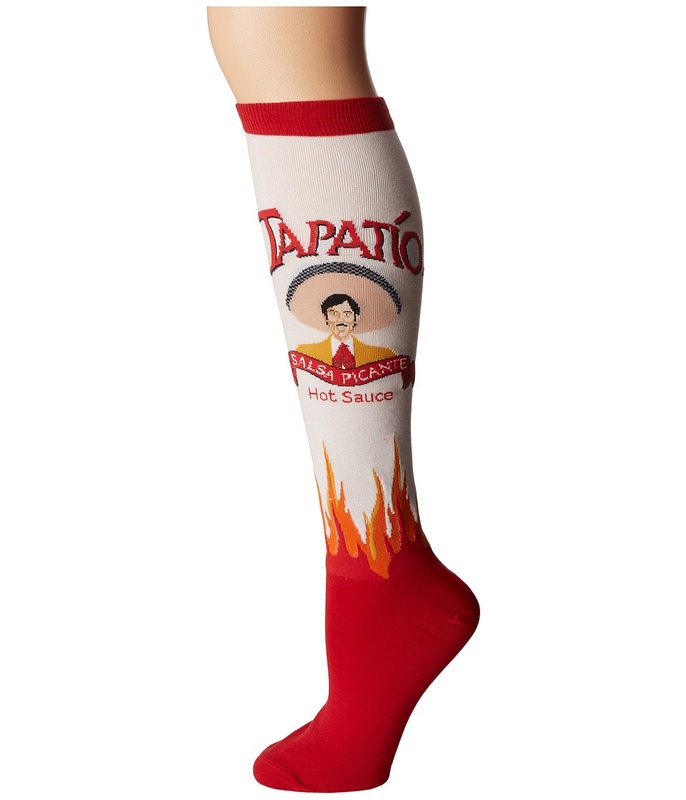 Show off your saucy side in these spicy hot Tapatio Knee High socks by Socksmith! Sold as a one-pair pack. Knee high length offers extended coverage. Self-adjusting welt cuff. Deep heel pocket. Y-stitch heel. 63 percent cotton, 34 percent nylon, 3 percent lycra spandex. Machine wash cold, tumble dry low. Imported. Super sweet, not really a bully in the French-Knee socks. Sold as a one-pair pack. Over-the-knee high length offers extended coverage. French bulldog face at knee. Self-adjusting welt cuff. Deep heel pocket. Y-stitch heel. 55 percent cotton, 43 percent nylon, 2 percent spandex Machine wash cold, tumble dry low. Imported. Dad life has never been so stylish than in the Socksmith Bamboo Golf Clubs. Sold as a one-pair pack. Crew-cut style sits at calf. Repeat golf club print. Self-adjusting welt cuff. Deep heel pocket. Y-stitch heel. Low-profile toe stitching for great in-shoe feel. 66 percent rayon from bamboo, 32 percent nylon, 2 percent spandex. Machine wash cold, tumble dry low. Imported. 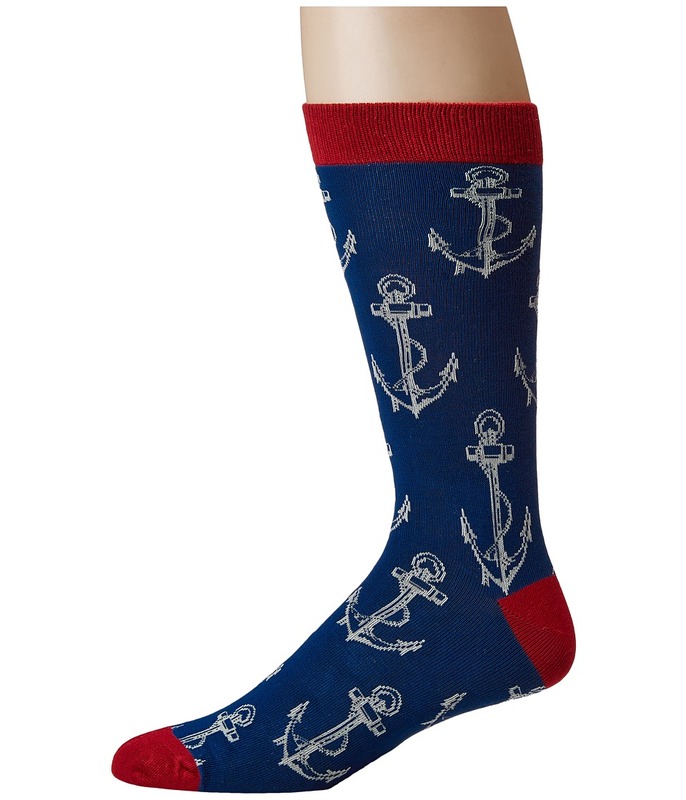 Drop the Anchors and enjoy these Socksmith crew socks. Sold as a one-pair pack. Crew-cut style sits at calf. Repeat anchor print throughout. Self-adjusting welt cuff. Deep heel pocket. Y-stitch heel. Low-profile toe stitching for great in-shoe feel. 68 percent rayon from bamboo, 30 percent nylon, 2 percent spandex. Machine wash cold, tumble dry low. Imported. 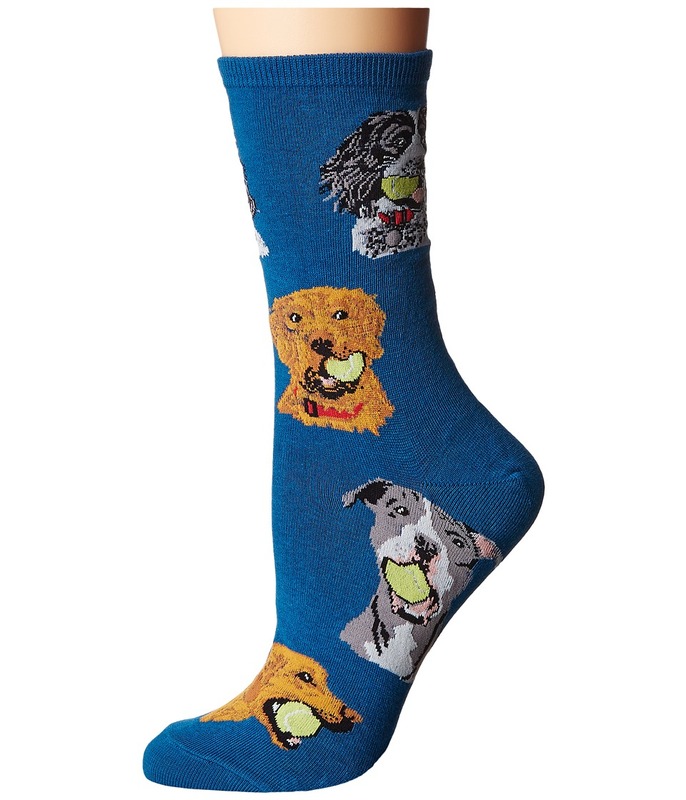 Dog lovers unit and fetch yourself a pair of the Ball Dog socks by Socksmith! Sold as a one-pair pack. Crew-cut style sits at the calf. Self-adjusting welt cuff. Deep heel pocket. Y-stitch heel. 70 percent cotton, 27 percent nylon, 3 percent lycra Machine wash cold, tumble dry low. Imported. You have guac to be kidding me! 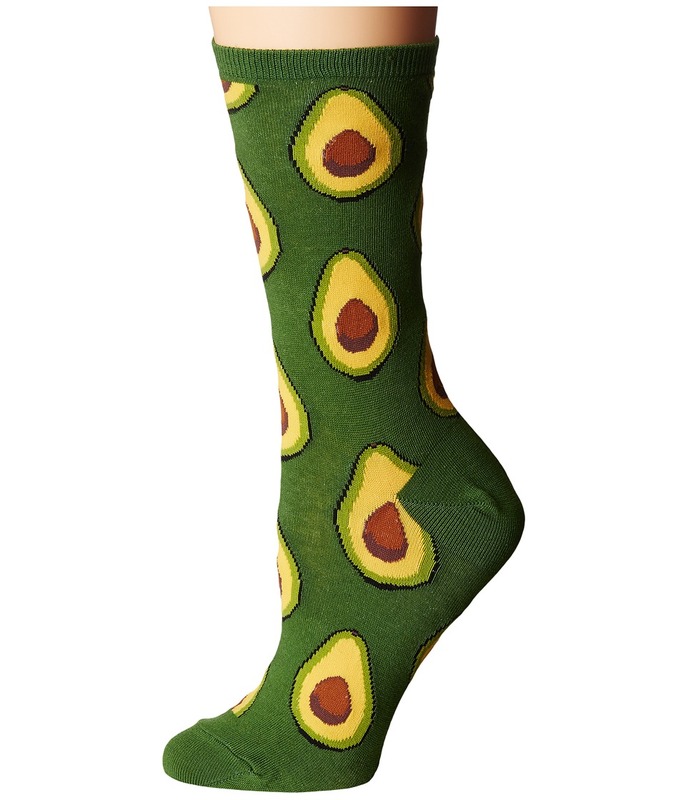 For your favorite guy or girl who just can~t get enough of those ~cados, gift them a pair of the Socksmith Avocado socks! Sold as a one-pair pack. Crew-cut style sits at the calf. Self-adjusting welt cuff. Deep heel pocket. Y-stitch heel. 63 percent cotton, 34 percent nylon, 3 percent spandex Machine wash cold, tumble dry low. Imported. 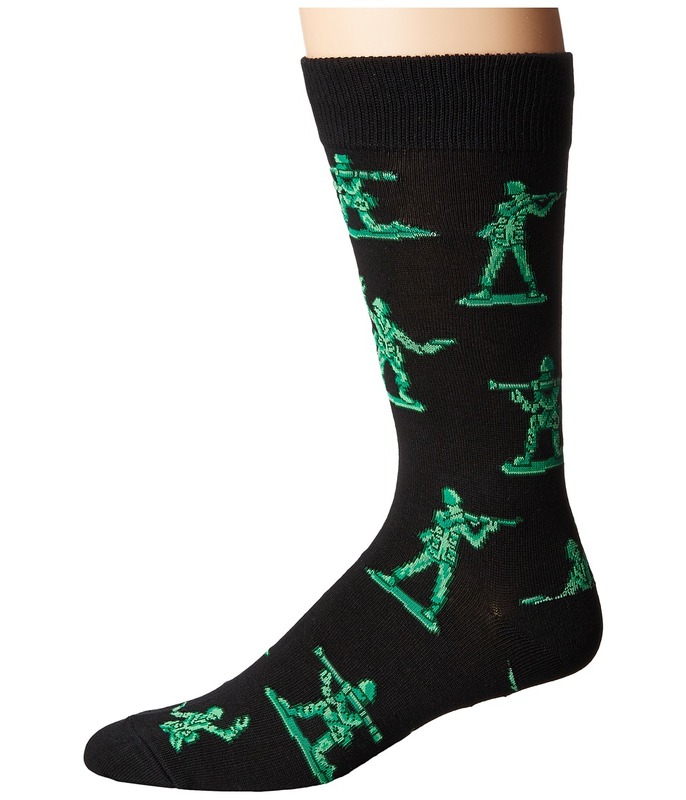 Bring back memories of your childhood with the ever courageous Army Men socks by Socksmith! Sold as a one-pair pack. Crew-cut style sits at the calf. Self-adjusting welt cuff. Deep heel pocket. Y-stitch heel. 70 percent cotton, 27 percent nylon, 3 percent lycra spandex. Machine wash cold, tumble dry low. Imported. A storybook print with a modern Socksmith finish. Sold as a one-pair pack. Crew-cut style sits at calf. 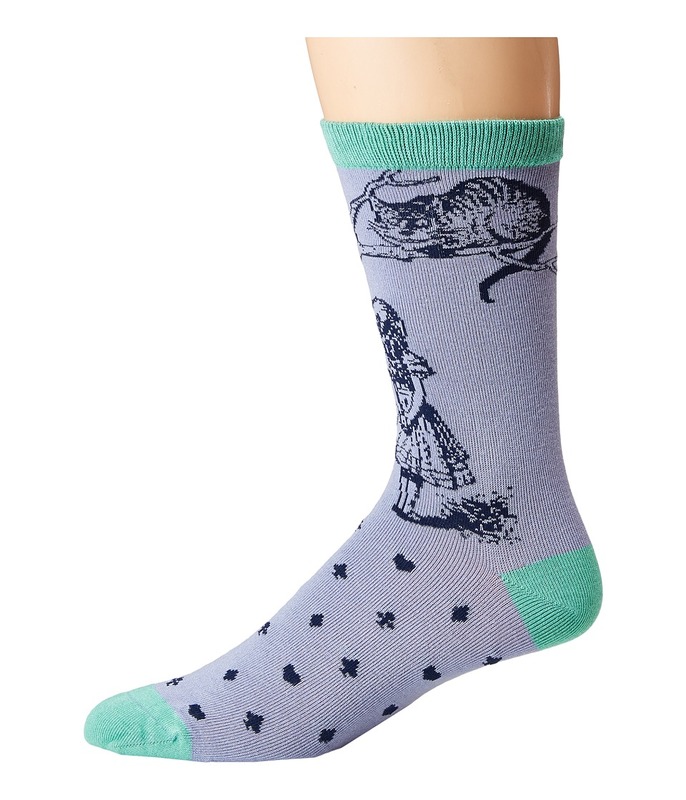 Alice and Cheshire Cat print. Self-adjusting welt cuff. Deep heel pocket. Y-stitch heel. Low-profile toe stitching for great in-shoe feel. 73 percent rayon from bamboo, 25 percent nylon, 2 percent spandex. Machine wash cold, tumble dry low. Imported. Live the dance life no matter which shoes you choose today. Sold as a one-pair pack. Crew-cut style sits at the calf. Self-adjusting welt cuff. Ribbed cuff. Elastic arch support. Deep heel pocket. Y-stitch heel. Reinforced toe and heel. 63 percent cotton, 34 percent nylon, 3 percent lycra spandex. Machine wash cold, dry flat. Imported. 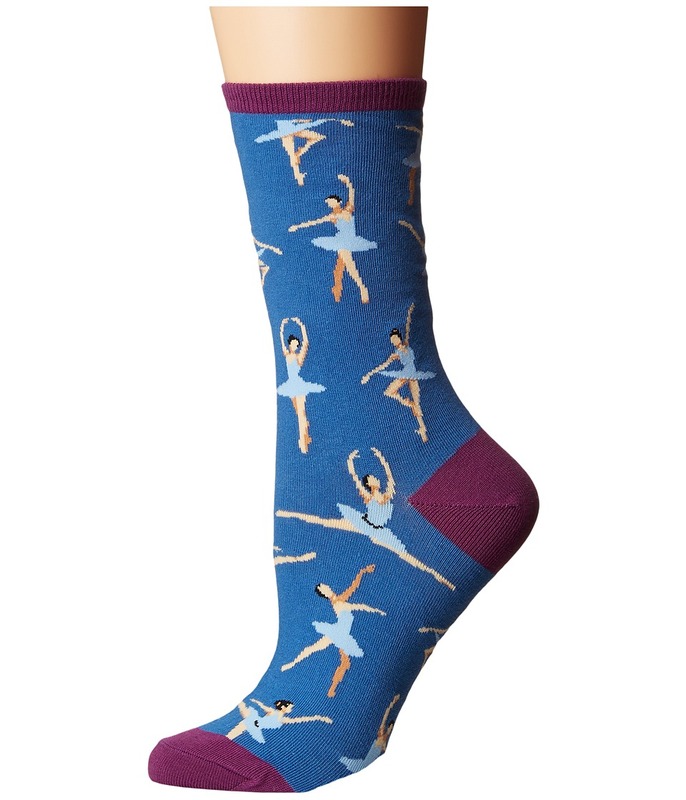 Show the world how fierce you really are in the Attack of The 50 FT Woman socks by Socksmith! Sold as a one-pair pack. Knee high length offers extended coverage. Self-adjusting welt cuff. Deep heel pocket. Y-stitch heel. Reinforced toe and heel. 63 percent cotton, 34 percent nylon, 3 percent spandex. Machine wash cold, tumble dry low. Imported. 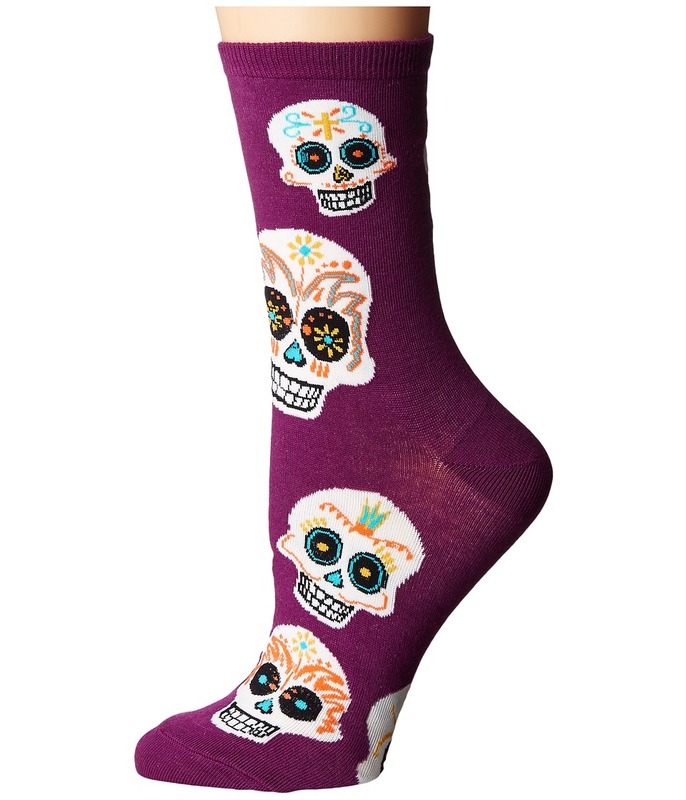 Give your casual look some edge with the eye-popping Big Muertos Skull socks by Socksmith. Sold as a one-pair pack. Crew-cut style sits at the calf. Self-adjusting welt cuff. Ribbed cuff. Elastic arch support. Deep heel pocket. Y-stitch heel. 70 percent cotton, 27 percent nylon, 3 percent lycra spandex. Machine wash warm. Line dry. Imported. 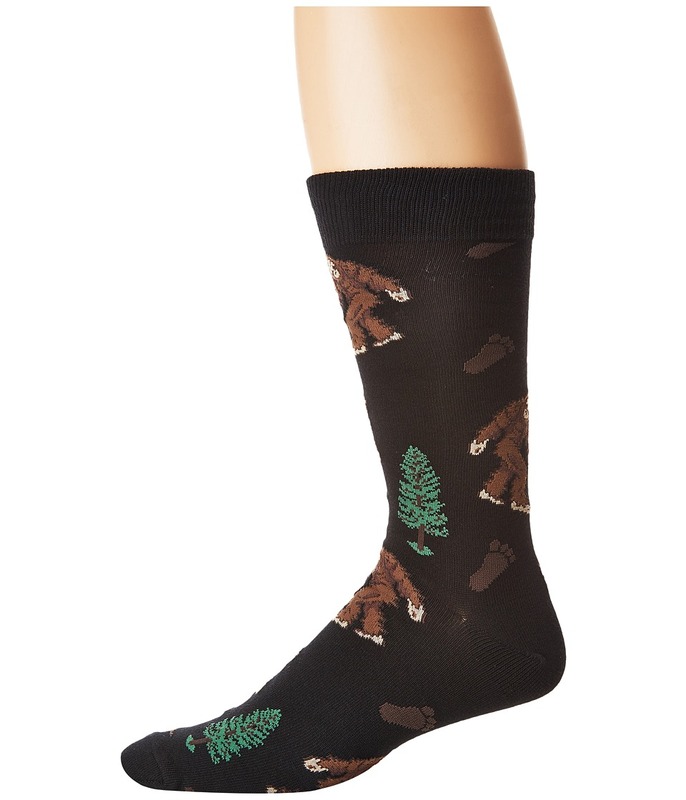 From the wilderness to your shoes, enjoy the Socksmith Bigfoot. Sold as a one-pair pack. Crew-cut style sits at the calf. Repeat bigfoot print throughout. Self-adjusting welt cuff. Ribbed cuff. Elastic arch support. Deep heel pocket. Y-stitch heel. Reinforced toe and heel. 70 percent cotton, 27 percent nylon, 3 percent spandex. Machine wash cold, tumble dry low. Imported.